Home flowers online Why Say It With Flowers? It's Valentine's Day and what better way to say I Love You than with flowers. Every woman will swoon over lovely blooms. Whether you just picked it from your garden or it's a beautiful roses arrangement, you can never go wrong. My main man sure knows how to flatter me. 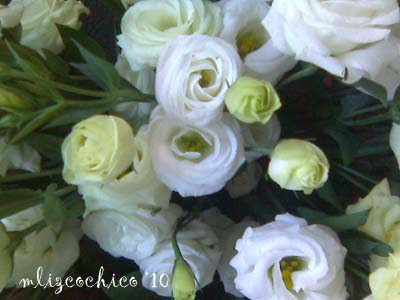 When I opened my eyes this morning, these white beauties were on top of my bedside table with a message full of loving words that are of course, for my eyes only. It didn't end there, beside the flowers was a box of my favorite chocolate waiting for me. Everyone knows that the tradition of sending flowers (roses especially) on this very special day is a timeless one. It's one of the best ways to express love and appreciation to someone. Lovely blooms definitely brighten one's day. The silky petals, and fragrant scent of roses are enough to overwhelm your lady love with joy. You may also take this opportunity to send flowers and show your appreciation to friends and family who has done something kind. Your mom took care of your kids while you had dinner with your wife? Give her flowers. The simple act of giving flowers can turn a seemingly dull day into a colorful one. How sweet naman ni J!